Apologies for not posting these earlier. Things have been pretty hectic for both of us with school and work, and I went to visit my family for a little bit. Elle has been pretty busy since we last updated! She attended the Los Angeles Film Festival Premiere of Galveston and went to Paris for L’Oreal Fashion Week where she walked the runway. Of course we also have some airport photos of her at LAX and JFK, as well as CDG airport in Paris, France. She was also in a couple of magazines. The gallery has been updated with over 400 photos, so please go check them out! Elle attended a special screening of I Think We’re Alone Now at the Dolby Theatre on September 12. Our gallery has been update with images. Our gallery has been updated with various portrait sessions of Elle at the Toronto International Film Festival 2018! She was there to promote Teen Spirit. I got to watch the movie this past Sunday and Elle’s voice caught me completely off guard. You’ll love her singing! 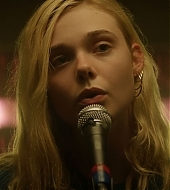 During the Q&A, actor/director Max Minghella mentioned there was no need to treat her voice, and what we hear is actually her singing while filming. So proud! As usual, we’ve divided the portraits by the photographers. I plan on adding the websites in which the they were released to the album descriptions soon. Lots going on right now, so not much free time, unfortunately. Elle has been busy promoting Teen Spirit at the Toronto International Film Festival. Over 120 images have been added to our gallery and you can view a couple of videos below of Elle promoting the film. My name is Paige and I am so excited to be a co-web here at Totally Elle! Elle was at the 44th Deauville American Film Festival in Deauville, France to promote Galveston. She even received a Rising Star award! We are so proud of you Elle. We have added over 100 images from the four events she attended during the festival to our gallery.